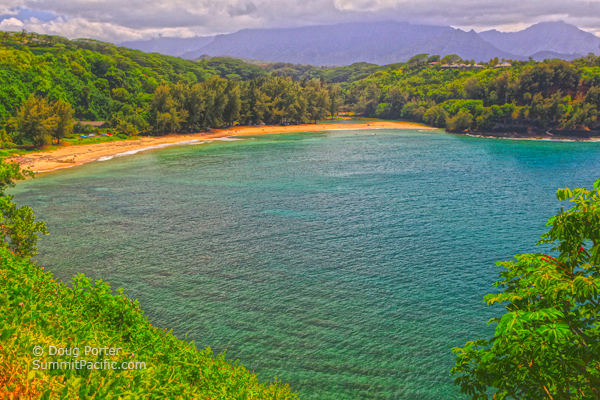 Kalihiwai Bay is a beautiful wide, north shore bay on the island of Kauai. Near the mouth of the Kalihiwai River it narrows and forms a crescent beach of golden sand with two high cliff ridges on either side. The slow moving river enters the ocean on the west end of the beach where it forms a lagoon of fresh water just behind the beach. A wide row of tall Ironwood trees line the back side of the beach providing shade. Cars park on the beach side of the road up on the sand under the trees and half a dozen homes are scattered along the other side of the road. 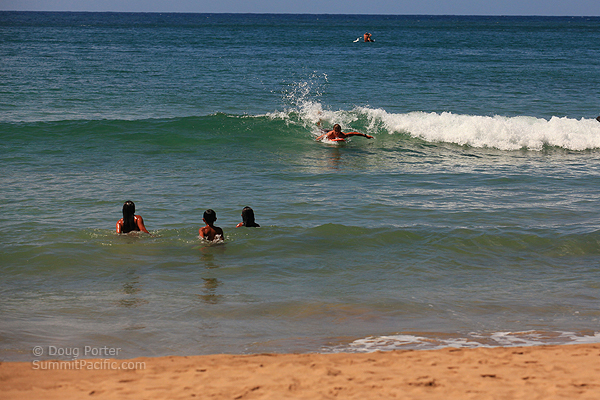 Kalihiwai is a good beach for swimming and playing in the ocean when the water is calm but strong undercurrents develop when the surf swell rises, especially in the winter months (November through March) when the north shore of Kauai typically gets bigger surf. 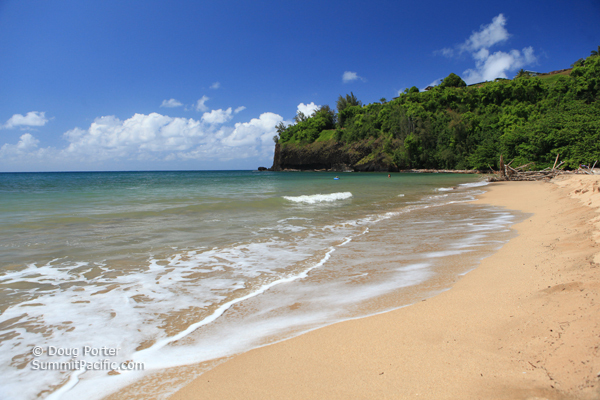 There are no facilities here, but after swimming in the ocean you do have the option of rinsing off in the fresh water of Kalihiwai River on the west end of the beach. Surfing Kalihiwai Bay is popular with experienced surfers during winter swells when an underwater shelf on the east side creates perfectly shaped hollow waves. However, lineups can be long and attitude the norm. During summer months when the bay is calmer, smaller waves make it more suitable for beginning surfers and boogie boarders although Hanalei Bay might be a better place to learn. Kalihiwai Road enters the valley from both the east and west sides and once formed a loop back out to Highway 56. However, the bridge over the river was destroyed in a tsunami that hit the island in 1946 and was never rebuilt. You can still get to the beach from either side, but if you come down on the west side of the valley, you'll have to park and wade across the river to get to the beach whereas the road on the east side parallels nearly the entire length of the beach. Kalihiwai River is spectacularly scenic. After plunging over the two tiered Kalihiwai Falls, the river moves slowly north under the gracefully curved Kalihiwai Bridge before reaching the bay. These falls are visible upstream from the bridge, but for a better view, a fun and popular activity is to kayak upstream from the beach, passing under the bridge to get to the falls. There is a pool at the bottom of the falls and a trail on the east side of the river will get you to the top. Inflatable Kayaks can be rented in several places including an outfitter or two in Hanalei. They can also give you a rack to carry an inflatable kayak on the roof of your rental car. Vacation Rentals in Princeville are nearby including homes, condos, and two hotels. Directions to Kalihiwai Bay Beach: Take highway 56 (Kuhio Highway) northwest from Kilauea for one half mile. Take the first right onto Kalihiwai Road and follow it to the beach. If coming from Princeville, skip the first Kalihiwai Road, cross the Kalihiwai Bridge, and then take the next left onto (the second) Kalihiwai Road. 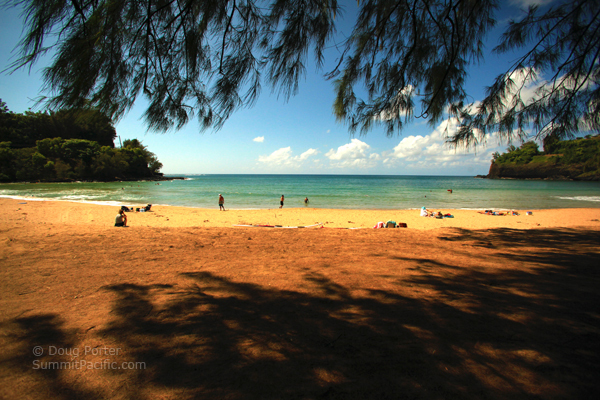 See dozens more beautiful Kauai Beaches.